I just ordered the striped lantern sleeve blouse (review here) in XSP for an extra 60% off. I also purchased the following three items in store this past weekend. I used three of my $25 cash cards for almost 50% off and I also redeemed my LOFT rewards since these were full-price items. Update 12/9: Last night I bought this beautiful new lacy split neck blouse in store in size XSP for 40% off and I used my cash card with another sweater I shared in my IG story. This top blouse true to size and I will do an update later tonight. 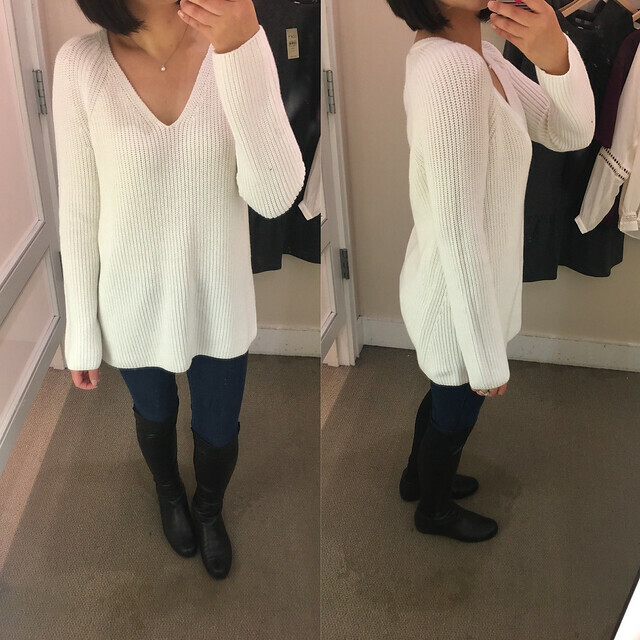 I feel in love with this soft and comfy white sweater when I put it on. 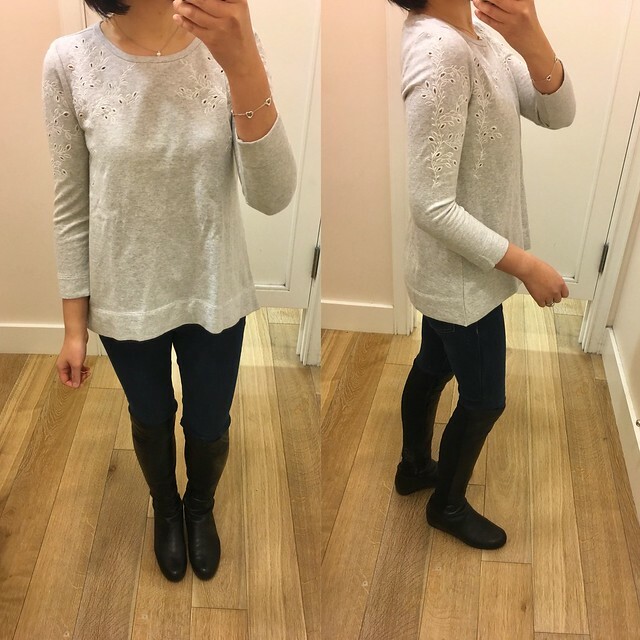 The fit is oversized and the sleeves are a bit long but I thought it was still really flattering. I got size XS regular but my usual size XXS would probably fit me best. It’s also available in a winter sky heather color which is a lovely light lavender/purple pastel color in person. I was on the hunt for this new ivy embroidered sweatshirt after seeing it online. The sales associate recalled seeing this in the back room so she found size XS for me. The sleeves may be snug for some. This top fits slightly smaller to true to size. I went with size XS regular since I love the swingy relaxed fit and the eyelet details remind me of my old favorite top from 2014 (last seen here). It’s a thicker sweatshirt material while my old top was a thin sweater. 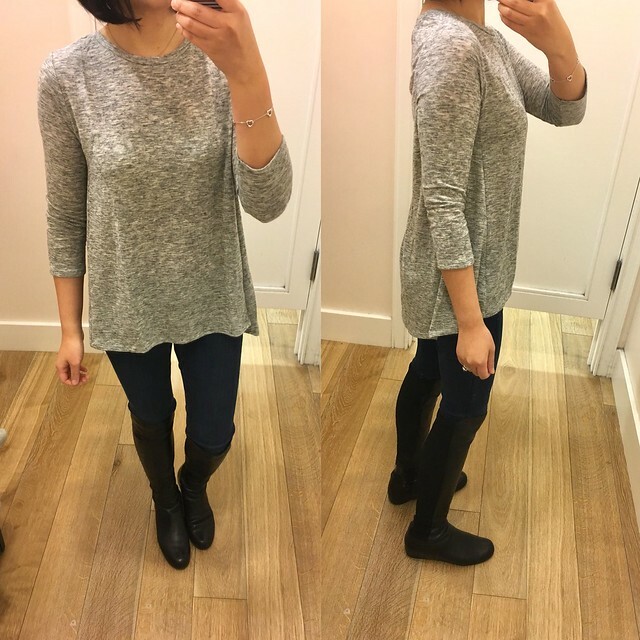 I tried on size XS, S and M in this swing tee and decided that size S fit me the best. Size XS regular pulled really strangely across my small bust while size M was too loose so size S was the perfect fit for me. It’s a very soft and simple tee that is really flattering in person. It’s also available in black and green. 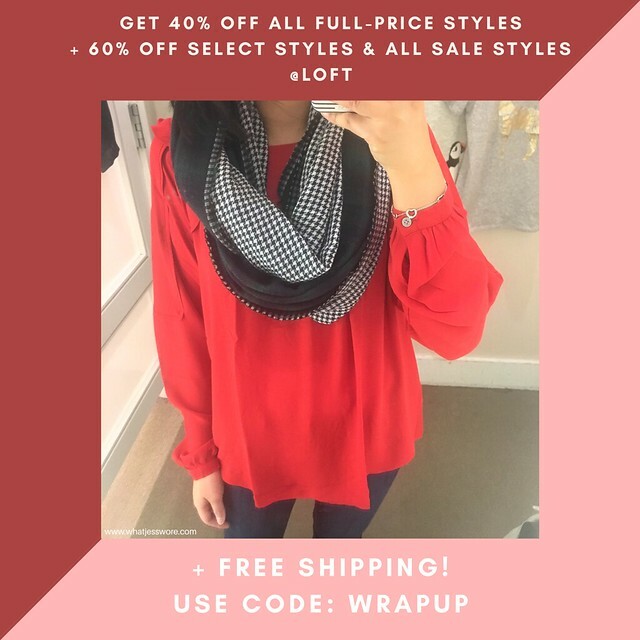 I loved this lacy ruffle shoulder blouse and the fit is exactly like the one I have in red at the top of this post. 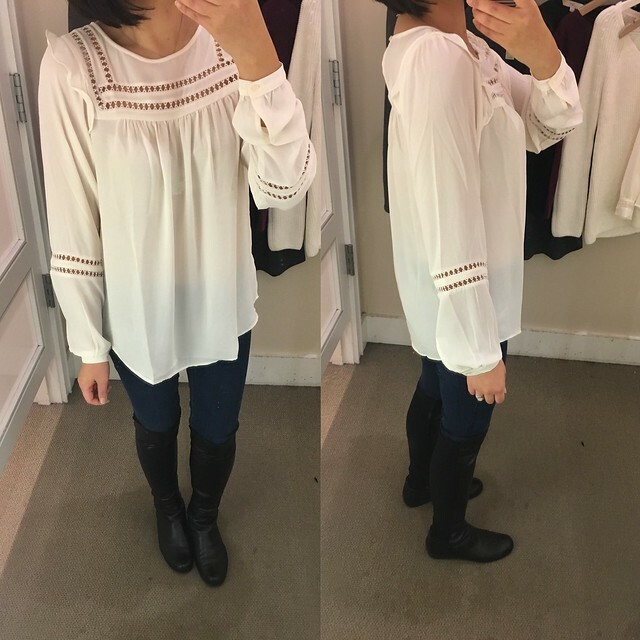 I tried on XS regular but I need this blouse in size XXS regular or XSP for the best fit. The material is sheer so a layering cami is required. This top will have a flowy fit in your usual LOFT sizing. 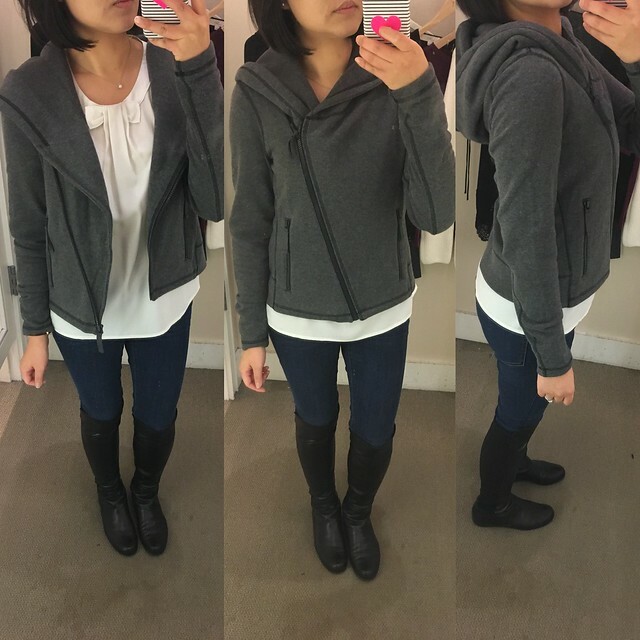 I also loved this casual moto hoodie by Lou & Grey. The shawl collar is surprisingly flattering instead of overpowering on my small frame. Size XS regular was a comfortable cropped fit on me. There are quite a few things I’m eying but I am waiting for a better discount on full-price items to pull the trigger. Sneak peek of more to come! It’s getting extremely late for me tonight so I will pause here. 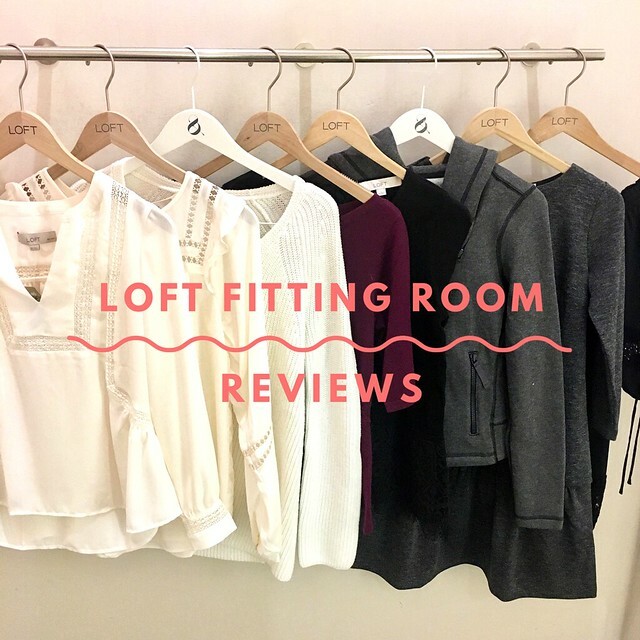 I’ll share more LOFT fitting room reviews including some items from Ann Taylor and J.Crew Factory as time permits or closer to the weekend. Stay tuned and thanks for your patience!